“God does not come in the thunder, but in the April breeze. Because he does not shout but only whispers, the soul must be careful not to neglect the visitation.” Archbishop Fulton Sheen, Lift Up Your Hearts. When God first came to us it was in the most hidden, silent and ordinary way; first in his mother’s womb and then, as a baby in a manger. In the Old Testament God prepared His people for this hidden way. Recall also how the prophet Elijah sought God in a cave on Mount Horeb (I Kings 19:9‑13). God made Himself known to Elijah not in power and might, but rather in “a still small voice” which Elijah heard from within the cave. 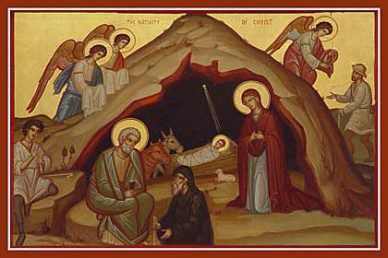 So, too, here in this Bethlehem cave, amidst the hushed prayers and whisperings of humans and angels alike, soon would come a little cry of newborn Divinity, muffled so as not to frighten any away – “a still small voice”. Let us listen to the ‘whisper’ of Christ in the womb. Let us quiet ourselves so we can hear the still, small voice in the manger. It is in such quiet events that God normally speaks to us. JUST 19 MORE PRAYING DAYS ‘TIL CHRIST’S BIRTH!